"Poe" redirects here. For other uses with the name Poe, see Poe (disambiguation). This article is about the American writer. For a relative, see Edgar Allan Poe (Maryland attorney general). For other people called Edgar Allan Poe, see Edgar Allan Poe (disambiguation). Edgar Allan Poe (/poʊ/; born Edgar Poe; January 19, 1809 – October 7, 1849) was an American writer, editor, and literary critic. Poe is best known for his poetry and short stories, particularly his tales of mystery and the macabre. He is widely regarded as a central figure of Romanticism in the United States and of American literature as a whole, and he was one of the country's earliest practitioners of the short story. He is generally considered the inventor of the detective fiction genre and is further credited with contributing to the emerging genre of science fiction. He was the first well-known American writer to earn a living through writing alone, resulting in a financially difficult life and career. Poe switched his focus to prose and spent the next several years working for literary journals and periodicals, becoming known for his own style of literary criticism. His work forced him to move among several cities, including Baltimore, Philadelphia, and New York City. He married Virginia Clemm in 1836, his 13-year-old cousin. In January 1845, Poe published his poem "The Raven" to instant success, but Virginia died of tuberculosis two years after its publication. Poe planned for years to produce his own journal The Penn (later renamed The Stylus), but he died before it could be produced. 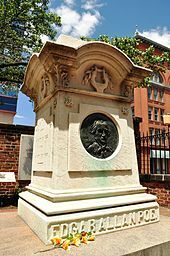 He died in Baltimore on October 7, 1849, at age 40; the cause of his death is unknown and has been variously attributed to alcohol, "brain congestion", cholera, drugs, heart disease, rabies, suicide, tuberculosis, and other causes. Poe and his works influenced literature around the world, as well as specialized fields such as cosmology and cryptography. He and his work appear throughout popular culture in literature, music, films, and television. A number of his homes are dedicated museums today. The Mystery Writers of America present an annual award known as the Edgar Award for distinguished work in the mystery genre. This plaque in Boston marks the approximate location where Edgar Poe was born. 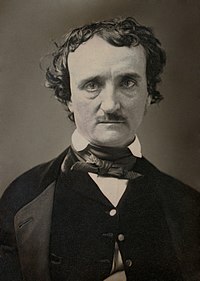 He was born Edgar Poe in Boston on January 19, 1809, the second child of English-born actress Elizabeth Arnold Hopkins Poe and actor David Poe Jr. He had an elder brother William Henry Leonard Poe and a younger sister Rosalie Poe. Their grandfather David Poe Sr. had immigrated from County Cavan, Ireland around 1750. Edgar may have been named after a character in William Shakespeare's King Lear which the couple were performing in 1809. His father abandoned the family in 1810, and his mother died a year later from consumption (pulmonary tuberculosis). Poe was then taken into the home of John Allan, a successful merchant in Richmond, Virginia who dealt in a variety of goods, including tobacco, cloth, wheat, tombstones, and slaves. The Allans served as a foster family and gave him the name "Edgar Allan Poe", though they never formally adopted him. The Allan family had Poe baptized in the Episcopal Church in 1812. John Allan alternately spoiled and aggressively disciplined his foster son. The family sailed to Britain in 1815, and Poe attended the grammar school for a short period in Irvine, Scotland (where John Allan was born) before rejoining the family in London in 1816. There he studied at a boarding school in Chelsea until summer 1817. He was subsequently entered at the Reverend John Bransby's Manor House School at Stoke Newington, then a suburb 4 miles (6 km) north of London. Poe moved with the Allans back to Richmond, Virginia in 1820. In 1824, he served as the lieutenant of the Richmond youth honor guard as Richmond celebrated the visit of the Marquis de Lafayette. In March 1825, John Allan's uncle and business benefactor William Galt died, who was said to be one of the wealthiest men in Richmond, leaving Allan several acres of real estate. The inheritance was estimated at $750,000 (equivalent to $17,000,000 in 2018). By summer 1825, Allan celebrated his expansive wealth by purchasing a two-story brick home named Moldavia. Poe may have become engaged to Sarah Elmira Royster before he registered at the University of Virginia in February 1826 to study ancient and modern languages. The university was in its infancy, established on the ideals of its founder Thomas Jefferson. It had strict rules against gambling, horses, guns, tobacco, and alcohol, but these rules were generally ignored. Jefferson had enacted a system of student self-government, allowing students to choose their own studies, make their own arrangements for boarding, and report all wrongdoing to the faculty. The unique system was still in chaos, and there was a high dropout rate. During his time there, Poe lost touch with Royster and also became estranged from his foster father over gambling debts. He claimed that Allan had not given him sufficient money to register for classes, purchase texts, and procure and furnish a dormitory. Allan did send additional money and clothes, but Poe's debts increased. He gave up on the university after a year but did not feel welcome returning to Richmond, especially when he learned that his sweetheart Royster had married Alexander Shelton. He traveled to Boston in April 1827, sustaining himself with odd jobs as a clerk and newspaper writer, and he started using the pseudonym Henri Le Rennet during this period. 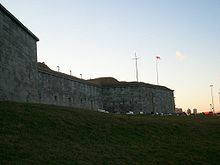 Poe was first stationed at Boston's Fort Independence while in the Army. Poe was unable to support himself, so he enlisted in the United States Army as a private on May 27, 1827, using the name "Edgar A. Perry". He claimed that he was 22 years old even though he was 18. He first served at Fort Independence in Boston Harbor for five dollars a month. That same year, he released his first book, a 40-page collection of poetry titled Tamerlane and Other Poems, attributed with the byline "by a Bostonian". Only 50 copies were printed, and the book received virtually no attention. Poe's regiment was posted to Fort Moultrie in Charleston, South Carolina and traveled by ship on the brig Waltham on November 8, 1827. Poe was promoted to "artificer", an enlisted tradesman who prepared shells for artillery, and had his monthly pay doubled. He served for two years and attained the rank of Sergeant Major for Artillery (the highest rank that a noncommissioned officer could achieve); he then sought to end his five-year enlistment early. He revealed his real name and his circumstances to his commanding officer, Lieutenant Howard. Howard would only allow Poe to be discharged if he reconciled with John Allan and wrote a letter to Allan, who was unsympathetic. Several months passed and pleas to Allan were ignored; Allan may not have written to Poe even to make him aware of his foster mother's illness. Frances Allan died on February 28, 1829, and Poe visited the day after her burial. Perhaps softened by his wife's death, John Allan agreed to support Poe's attempt to be discharged in order to receive an appointment to the United States Military Academy at West Point. Poe was finally discharged on April 15, 1829, after securing a replacement to finish his enlisted term for him. 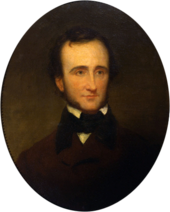 Before entering West Point, Poe moved back to Baltimore for a time to stay with his widowed aunt Maria Clemm, her daughter Virginia Eliza Clemm (Poe's first cousin), his brother Henry, and his invalid grandmother Elizabeth Cairnes Poe. Meanwhile, Poe published his second book Al Aaraaf, Tamerlane and Minor Poems in Baltimore in 1829. Poe traveled to West Point and matriculated as a cadet on July 1, 1830. In October 1830, John Allan married his second wife Louisa Patterson. The marriage and bitter quarrels with Poe over the children born to Allan out of affairs led to the foster father finally disowning Poe. Poe decided to leave West Point by purposely getting court-martialed. On February 8, 1831, he was tried for gross neglect of duty and disobedience of orders for refusing to attend formations, classes, or church. Poe tactically pleaded not guilty to induce dismissal, knowing that he would be found guilty. He left for New York in February 1831 and released a third volume of poems, simply titled Poems. The book was financed with help from his fellow cadets at West Point, many of whom donated 75 cents to the cause, raising a total of $170. They may have been expecting verses similar to the satirical ones that Poe had been writing about commanding officers. It was printed by Elam Bliss of New York, labeled as "Second Edition," and including a page saying, "To the U.S. Corps of Cadets this volume is respectfully dedicated". The book once again reprinted the long poems "Tamerlane" and "Al Aaraaf" but also six previously unpublished poems, including early versions of "To Helen", "Israfel", and "The City in the Sea". He returned to Baltimore to his aunt, brother, and cousin in March 1831. His elder brother Henry had been in ill health, in part due to problems with alcoholism, and he died on August 1, 1831. After his brother's death, Poe began more earnest attempts to start his career as a writer, but he chose a difficult time in American publishing to do so. He was one of the first Americans to live by writing alone and was hampered by the lack of an international copyright law. American publishers often produced unauthorized copies of British works rather than paying for new work by Americans. The industry was also particularly hurt by the Panic of 1837. There was a booming growth in American periodicals around this time, fueled in part by new technology, but many did not last beyond a few issues. Publishers often refused to pay their writers or paid them much later than they promised, and Poe repeatedly resorted to humiliating pleas for money and other assistance. Poe (age 26) obtained a license in 1835 to marry his cousin Virginia Clemm (age 13). They were married for 11 years until her death, which may have inspired some of his writing. After his early attempts at poetry, Poe had turned his attention to prose. He placed a few stories with a Philadelphia publication and began work on his only drama Politian. The Baltimore Saturday Visiter awarded him a prize in October 1833 for his short story "MS. Found in a Bottle". The story brought him to the attention of John P. Kennedy, a Baltimorean of considerable means. He helped Poe place some of his stories, and introduced him to Thomas W. White, editor of the Southern Literary Messenger in Richmond, Virginia. Poe became assistant editor of the periodical in August 1835, but White discharged him within a few weeks for being drunk on the job. Poe returned to Baltimore where he obtained a license to marry his cousin Virginia on September 22, 1835, though it is unknown if they were married at that time. He was 26 and she was 13. He was reinstated by White after promising good behavior, and he went back to Richmond with Virginia and her mother. He remained at the Messenger until January 1837. During this period, Poe claimed that its circulation increased from 700 to 3,500. He published several poems, book reviews, critiques, and stories in the paper. On May 16, 1836, he and Virginia held a Presbyterian wedding ceremony at their Richmond boarding house, with a witness falsely attesting Clemm's age as 21. The Narrative of Arthur Gordon Pym of Nantucket was published and widely reviewed in 1838. In the summer of 1839, Poe became assistant editor of Burton's Gentleman's Magazine. He published numerous articles, stories, and reviews, enhancing his reputation as a trenchant critic which he had established at the Southern Literary Messenger. Also in 1839, the collection Tales of the Grotesque and Arabesque was published in two volumes, though he made little money from it and it received mixed reviews. Poe left Burton's after about a year and found a position as assistant at Graham's Magazine. In June 1840, Poe published a prospectus announcing his intentions to start his own journal called The Stylus, although he originally intended to call it The Penn, as it would have been based in Philadelphia. He bought advertising space for his prospectus in the June 6, 1840 issue of Philadelphia's Saturday Evening Post: "Prospectus of the Penn Magazine, a Monthly Literary journal to be edited and published in the city of Philadelphia by Edgar A. Poe." The journal was never produced before Poe's death. Around this time, he attempted to secure a position within the administration of President Tyler, claiming that he was a member of the Whig Party. He hoped to be appointed to the Custom House in Philadelphia with help from President Tyler's son Robert, an acquaintance of Poe's friend Frederick Thomas. Poe failed to show up for a meeting with Thomas to discuss the appointment in mid-September 1842, claiming to have been sick, though Thomas believed that he had been drunk. Poe was promised an appointment, but all positions were filled by others. One evening in January 1842, Virginia showed the first signs of consumption, now known as tuberculosis, while singing and playing the piano, which Poe described as breaking a blood vessel in her throat. She only partially recovered, and Poe began to drink more heavily under the stress of her illness. He left Graham's and attempted to find a new position, for a time angling for a government post. He returned to New York where he worked briefly at the Evening Mirror before becoming editor of the Broadway Journal, and later its owner. There he alienated himself from other writers by publicly accusing Henry Wadsworth Longfellow of plagiarism, though Longfellow never responded. On January 29, 1845, his poem "The Raven" appeared in the Evening Mirror and became a popular sensation. It made Poe a household name almost instantly, though he was paid only $9 for its publication. It was concurrently published in The American Review: A Whig Journal under the pseudonym "Quarles". The Broadway Journal failed in 1846, and Poe moved to a cottage in Fordham, New York in what is now the Bronx. That home is now known as the Edgar Allan Poe Cottage, relocated to a park near the southeast corner of the Grand Concourse and Kingsbridge Road. Nearby, he befriended the Jesuits at St. John's College, now Fordham University. Virginia died at the cottage on January 30, 1847. Biographers and critics often suggest that Poe's frequent theme of the "death of a beautiful woman" stems from the repeated loss of women throughout his life, including his wife. Poe was increasingly unstable after his wife's death. He attempted to court poet Sarah Helen Whitman who lived in Providence, Rhode Island. Their engagement failed, purportedly because of Poe's drinking and erratic behavior. There is also strong evidence that Whitman's mother intervened and did much to derail their relationship. Poe then returned to Richmond and resumed a relationship with his childhood sweetheart Sarah Elmira Royster. Edgar Allan Poe is buried at Westminster Hall in Baltimore, Maryland (Lat: 39.29027; Long: −76.62333). The circumstances and cause of his death remain uncertain. On October 3, 1849, Poe was found delirious on the streets of Baltimore, "in great distress, and… in need of immediate assistance", according to Joseph W. Walker who found him. He was taken to the Washington Medical College where he died on Sunday, October 7, 1849 at 5:00 in the morning. He was not coherent long enough to explain how he came to be in his dire condition and, oddly, was wearing clothes that were not his own. He is said to have repeatedly called out the name "Reynolds" on the night before his death, though it is unclear to whom he was referring. Some sources say that Poe's final words were "Lord help my poor soul". All medical records have been lost, including his death certificate. Newspapers at the time reported Poe's death as "congestion of the brain" or "cerebral inflammation", common euphemisms for death from disreputable causes such as alcoholism. The actual cause of death remains a mystery. Speculation has included delirium tremens, heart disease, epilepsy, syphilis, meningeal inflammation, cholera, and rabies. One theory dating from 1872 suggests that cooping was the cause of Poe's death, a form of electoral fraud in which citizens were forced to vote for a particular candidate, sometimes leading to violence and even murder. The day that Edgar Allan Poe was buried, a long obituary appeared in the New York Tribune signed "Ludwig". It was soon published throughout the country. The piece began, "Edgar Allan Poe is dead. He died in Baltimore the day before yesterday. This announcement will startle many, but few will be grieved by it." "Ludwig" was soon identified as Rufus Wilmot Griswold, an editor, critic, and anthologist who had borne a grudge against Poe since 1842. Griswold somehow became Poe's literary executor and attempted to destroy his enemy's reputation after his death. Griswold wrote a biographical article of Poe called "Memoir of the Author", which he included in an 1850 volume of the collected works. He depicted Poe as a depraved, drunken, drug-addled madman and included Poe's letters as evidence. Many of his claims were either lies or distorted half-truths. For example, it is now known that Poe was not a drug addict. Griswold's book was denounced by those who knew Poe well, but it became a popularly accepted biographical source. This occurred in part because it was the only full biography available and was widely reprinted, and in part because readers thrilled at the thought of reading works by an "evil" man. Letters that Griswold presented as proof were later revealed to be forgeries. Poe's best known fiction works are Gothic, a genre that he followed to appease the public taste. His most recurring themes deal with questions of death, including its physical signs, the effects of decomposition, concerns of premature burial, the reanimation of the dead, and mourning. Many of his works are generally considered part of the dark romanticism genre, a literary reaction to transcendentalism which Poe strongly disliked. He referred to followers of the transcendental movement as "Frog-Pondians", after the pond on Boston Common, and ridiculed their writings as "metaphor—run mad," lapsing into "obscurity for obscurity's sake" or "mysticism for mysticism's sake". Poe once wrote in a letter to Thomas Holley Chivers that he did not dislike Transcendentalists, "only the pretenders and sophists among them". Beyond horror, Poe also wrote satires, humor tales, and hoaxes. For comic effect, he used irony and ludicrous extravagance, often in an attempt to liberate the reader from cultural conformity. "Metzengerstein" is the first story that Poe is known to have published and his first foray into horror, but it was originally intended as a burlesque satirizing the popular genre. Poe also reinvented science fiction, responding in his writing to emerging technologies such as hot air balloons in "The Balloon-Hoax". Poe wrote much of his work using themes aimed specifically at mass-market tastes. To that end, his fiction often included elements of popular pseudosciences, such as phrenology and physiognomy. Poe's writing reflects his literary theories, which he presented in his criticism and also in essays such as "The Poetic Principle". He disliked didacticism and allegory, though he believed that meaning in literature should be an undercurrent just beneath the surface. Works with obvious meanings, he wrote, cease to be art. He believed that work of quality should be brief and focus on a specific single effect. To that end, he believed that the writer should carefully calculate every sentiment and idea. Poe describes his method in writing "The Raven" in the essay "The Philosophy of Composition", and he claims to have strictly followed this method. It has been questioned whether he really followed this system, however. T.S. Eliot said: "It is difficult for us to read that essay without reflecting that if Poe plotted out his poem with such calculation, he might have taken a little more pains over it: the result hardly does credit to the method." Biographer Joseph Wood Krutch described the essay as "a rather highly ingenious exercise in the art of rationalization". 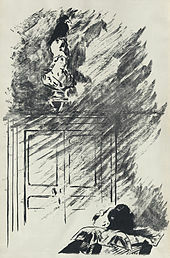 Illustration by French impressionist Édouard Manet for the Stéphane Mallarmé translation of "The Raven", 1875. Digitally restored. During his lifetime, Poe was mostly recognized as a literary critic. Fellow critic James Russell Lowell called him "the most discriminating, philosophical, and fearless critic upon imaginative works who has written in America", suggesting—rhetorically—that he occasionally used prussic acid instead of ink. Poe's caustic reviews earned him the reputation of being a "tomahawk man". A favorite target of Poe's criticism was Boston's acclaimed poet Henry Wadsworth Longfellow, who was often defended by his literary friends in what was later called "The Longfellow War". Poe accused Longfellow of "the heresy of the didactic", writing poetry that was preachy, derivative, and thematically plagiarized. Poe correctly predicted that Longfellow's reputation and style of poetry would decline, concluding, "We grant him high qualities, but deny him the Future". Poe was also known as a writer of fiction and became one of the first American authors of the 19th century to become more popular in Europe than in the United States. Poe is particularly respected in France, in part due to early translations by Charles Baudelaire. Baudelaire's translations became definitive renditions of Poe's work throughout Europe. Poe's early detective fiction tales featuring C. Auguste Dupin laid the groundwork for future detectives in literature. Sir Arthur Conan Doyle said, "Each [of Poe's detective stories] is a root from which a whole literature has developed.... Where was the detective story until Poe breathed the breath of life into it?" The Mystery Writers of America have named their awards for excellence in the genre the "Edgars". Poe's work also influenced science fiction, notably Jules Verne, who wrote a sequel to Poe's novel The Narrative of Arthur Gordon Pym of Nantucket called An Antarctic Mystery, also known as The Sphinx of the Ice Fields. Science fiction author H.G. Wells noted, "Pym tells what a very intelligent mind could imagine about the south polar region a century ago." In 2013, The Guardian cited The Narrative of Arthur Gordon Pym of Nantucket as one of the greatest novels ever written in the English language, and noted its influence on later authors such as Henry James, Arthur Conan Doyle, B. Traven, and David Morrell. Alfred Hitchcock once said "It's because I liked Edgar Allan Poe's stories so much that I began to make suspense films." Like many famous artists, Poe's works have spawned imitators. One trend among imitators of Poe has been claims by clairvoyants or psychics to be "channeling" poems from Poe's spirit. One of the most notable of these was Lizzie Doten, who published Poems from the Inner Life in 1863, in which she claimed to have "received" new compositions by Poe's spirit. The compositions were re-workings of famous Poe poems such as "The Bells", but which reflected a new, positive outlook. Even so, Poe has received not only praise, but criticism as well. This is partly because of the negative perception of his personal character and its influence upon his reputation. William Butler Yeats was occasionally critical of Poe and once called him "vulgar". Transcendentalist Ralph Waldo Emerson reacted to "The Raven" by saying, "I see nothing in it", and derisively referred to Poe as "the jingle man". Aldous Huxley wrote that Poe's writing "falls into vulgarity" by being "too poetical"—the equivalent of wearing a diamond ring on every finger. It is believed that only 12 copies have survived of Poe's first book Tamerlane and Other Poems. In December 2009, one copy sold at Christie's, New York for $662,500, a record price paid for a work of American literature. Eureka: A Prose Poem, an essay written in 1848, included a cosmological theory that presaged the Big Bang theory by 80 years, as well as the first plausible solution to Olbers' paradox. Poe eschewed the scientific method in Eureka and instead wrote from pure intuition. For this reason, he considered it a work of art, not science, but insisted that it was still true and considered it to be his career masterpiece. Even so, Eureka is full of scientific errors. In particular, Poe's suggestions ignored Newtonian principles regarding the density and rotation of planets. Poe had a keen interest in cryptography. He had placed a notice of his abilities in the Philadelphia paper Alexander's Weekly (Express) Messenger, inviting submissions of ciphers which he proceeded to solve. In July 1841, Poe had published an essay called "A Few Words on Secret Writing" in Graham's Magazine. Capitalizing on public interest in the topic, he wrote "The Gold-Bug" incorporating ciphers as an essential part of the story. Poe's success with cryptography relied not so much on his deep knowledge of that field (his method was limited to the simple substitution cryptogram) as on his knowledge of the magazine and newspaper culture. His keen analytical abilities, which were so evident in his detective stories, allowed him to see that the general public was largely ignorant of the methods by which a simple substitution cryptogram can be solved, and he used this to his advantage. The sensation that Poe created with his cryptography stunts played a major role in popularizing cryptograms in newspapers and magazines. Poe had an influence on cryptography beyond increasing public interest during his lifetime. William Friedman, America's foremost cryptologist, was heavily influenced by Poe. Friedman's initial interest in cryptography came from reading "The Gold-Bug" as a child, an interest that he later put to use in deciphering Japan's PURPLE code during World War II. The historical Edgar Allan Poe has appeared as a fictionalized character, often representing the "mad genius" or "tormented artist" and exploiting his personal struggles. Many such depictions also blend in with characters from his stories, suggesting that Poe and his characters share identities. Often, fictional depictions of Poe use his mystery-solving skills in such novels as The Poe Shadow by Matthew Pearl. The Edgar Allan Poe National Historic Site in Philadelphia is one of several preserved former residences of Poe. No childhood home of Poe is still standing, including the Allan family's Moldavia estate. The oldest standing home in Richmond, the Old Stone House, is in use as the Edgar Allan Poe Museum, though Poe never lived there. The collection includes many items that Poe used during his time with the Allan family, and also features several rare first printings of Poe works. 13 West Range is the dorm room that Poe is believed to have used while studying at the University of Virginia in 1826; it is preserved and available for visits. Its upkeep is now overseen by a group of students and staff known as the Raven Society. The earliest surviving home in which Poe lived is in Baltimore, preserved as the Edgar Allan Poe House and Museum. Poe is believed to have lived in the home at the age of 23 when he first lived with Maria Clemm and Virginia (as well as his grandmother and possibly his brother William Henry Leonard Poe). It is open to the public and is also the home of the Edgar Allan Poe Society. Of the several homes that Poe, his wife Virginia, and his mother-in-law Maria rented in Philadelphia, only the last house has survived. The Spring Garden home, where the author lived in 1843–1844, is today preserved by the National Park Service as the Edgar Allan Poe National Historic Site. 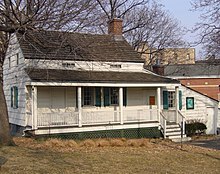 Poe's final home is preserved as the Edgar Allan Poe Cottage in the Bronx. In Boston, a commemorative plaque on Boylston Street is several blocks away from the actual location of Poe's birth. The house which was his birthplace at 62 Carver Street no longer exists; also, the street has since been renamed "Charles Street South". A "square" at the intersection of Broadway, Fayette, and Carver Streets had once been named in his honor, but it disappeared when the streets were rearranged. 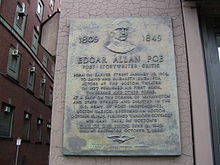 In 2009, the intersection of Charles and Boylston Streets (two blocks north of his birthplace) was designated "Edgar Allan Poe Square". In March 2014, fundraising was completed for construction of a permanent memorial sculpture at this location. The winning design by Stefanie Rocknak depicts a life-sized Poe striding against the wind, accompanied by a flying raven; his suitcase lid has fallen open, leaving a "paper trail" of literary works embedded in the sidewalk behind him. The public unveiling on October 5, 2014 was attended by former US poet laureate Robert Pinsky. Other Poe landmarks include a building in the Upper West Side where Poe temporarily lived when he first moved to New York. A plaque suggests that Poe wrote "The Raven" here. The bar still stands where legend says that Poe was last seen drinking before his death, in Fell's Point in Baltimore. The drinking establishment is now known as "The Horse You Came in On", and local lore insists that a ghost whom they call "Edgar" haunts the rooms above. A bottle of cognac and three roses were left at Poe's original grave marker for decades every January 19 by an unknown visitor affectionately referred to as the "Poe Toaster". Sam Porpora was a historian at the Westminster Church in Baltimore where Poe is buried, and he claimed on August 15, 2007 that he had started the tradition in 1949. Porpora said that the tradition began in order to raise money and enhance the profile of the church. His story has not been confirmed, and some details which he gave to the press are factually inaccurate. The Poe Toaster's last appearance was on January 19, 2009, the day of Poe's bicentennial. "A Descent into the Maelström"
"The Facts in the Case of M. Valdemar"
"The System of Doctor Tarr and Professor Fether"
^ Semtner, Christopher P. (2012). Edgar Allan Poe's Richmond : the Raven in the River City. Charleston [SC]: History Press. p. 15. ISBN 9781609496074. OCLC 779472206. ^ a b "Poe & Boston: 2009". The Raven Returns: Edgar Allan Poe Bicentennial Celebration. The Trustees of Boston College. Archived from the original on July 30, 2013. Retrieved May 26, 2012. ^ Schroth, Raymond A. Fordham: A History and Memoir. New York: Fordham University Press, 2008: 22–25. 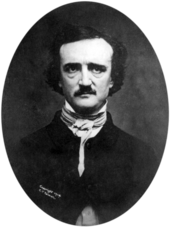 ^ Meyers 1992, p. 259 To read Griswold's full obituary, see Edgar Allan Poe obituary at Wikisource. ^ "(Introduction)" (Exhibition at Boston Public Library). The Raven in the Frog Pond: Edgar Allan Poe and the City of Boston. The Trustees of Boston College. December 17, 2009 – March 31, 2010. Retrieved May 26, 2012. ^ Zimmerman, Brett (2005). Edgar Allan Poe: Rhetoric and Style. Montreal: McGill-Queen's University Press. pp. 85–87. ISBN 978-0-7735-2899-4. ^ Lewis, Paul (March 6, 2011). "Quoth the detective: Edgar Allan Poe's case against the Boston literati". boston.com. Globe Newspaper Company. Archived from the original on June 3, 2013. Retrieved April 9, 2013. ^ "Longfellow's Serenity and Poe's Prediction" (Exhibition at Boston Public Library and Massachusetts Historical Society). Forgotten Chapters of Boston's Literary History. The Trustees of Boston College. March 28 – July 30, 2012. Retrieved May 22, 2012. ^ McCrum, Robert (November 23, 2013). "The 100 best novels: No 10 – The Narrative of Arthur Gordon Pym of Nantucket by Edgar Allan Poe (1838)". The Guardian. Archived from the original on September 11, 2016. Retrieved August 8, 2016. ^ "Edgar Allan Poe". The Guardian. July 22, 2008. Retrieved February 14, 2019. ^ "Edgar Allan Poe Birth Place". Massachusetts Historical Markers on Waymarking.com. Groundspeak, Inc. Archived from the original on May 15, 2013. Retrieved May 11, 2012. ^ Glenn, Joshua (April 9, 2007). "The house of Poe – mystery solved!". boston.com. The Boston Globe. Archived from the original on October 26, 2012. Retrieved May 22, 2012. ^ "Edgar Allan Poe Square". The City Record, and Boston News-letter. Archived from the original on July 10, 2010. Retrieved May 11, 2011. ^ "Edgar Allan Poe Square". Massachusetts Historical Markers on Waymarking.com. Groundspeak, Inc. Archived from the original on May 15, 2013. Retrieved May 11, 2012. ^ Fox, Jeremy C. (February 1, 2013). "Vision for an Edgar Allan Poe memorial in Boston comes closer to reality". boston.com (Boston Globe). Archived from the original on April 30, 2015. Retrieved April 9, 2013. ^ Kaiser, Johanna (April 23, 2012). "Boston chooses life-size Edgar Allan Poe statue to commemorate writer's ties to city". boston.com (Boston Globe). Archived from the original on May 29, 2013. Retrieved April 9, 2013. ^ "About the project". Edgar Allan Poe Square Public Art Project. Edgar Allan Poe Foundation of Boston, Inc. Archived from the original on April 23, 2013. Retrieved April 9, 2013. ^ Lee, M.G. (October 5, 2014). "Edgar Allan Poe immortalized in the city he loathed". Boston Globe. Archived from the original on July 2, 2015. Retrieved July 2, 2015. ^ Deas, Michael J. (1989). The Portraits and Daguerreotypes of Edgar Allan Poe. University of Virginia. pp. 47–51. ISBN 978-0813911809. ^ "Poe Toaster tribute is 'nevermore'". The Baltimore Sun. Tribune Company. January 19, 2010. Archived from the original on January 20, 2012. Retrieved January 19, 2012. Allen, Hervey (1927). "Introduction". The Works of Edgar Allan Poe. New York: P.F. Collier & Son. "Man Reveals Legend of Mystery Visitor to Edgar Allan Poe's Grave". Fox News. Associated Press. August 15, 2007. Archived from the original on December 22, 2007. Retrieved December 15, 2007. Benitez, R, Michael (September 15, 1996). "Poe's Death Is Rewritten as Case of Rabies, Not Telltale Alcohol". New York Times. Based on "A 39-year-old man with mental status change". Maryland Medical Journal. 45: 765–769. 1996. Benton, Richard P. (1987). "Poe's Literary Labors and Rewards". In Fisher, Benjamin Franklin IV. Myths and Reality: The Mysterious Mr. Poe. Baltimore: The Edgar Allan Poe Society. pp. 1–25. ISBN 978-0-9616449-1-8. Bramsback, Birgit (1970). "The Final Illness and Death of Edgar Allan Poe: An Attempt at Reassessment". Studia Neophilologica. XLII: 40. doi:10.1080/00393277008587456. BronxHistoricalSociety.org (2007). "Edgar Allan Poe Cottage". Archived from the original on October 11, 2007. Archived from the original on 2007-10-11. Burns, Niccole (November 15, 2006). "Poe wrote most important works in Philadelphia". School of Communication – University of Miami. Archived from the original on December 15, 2007. Retrieved October 13, 2007. Cappi, Alberto (1994). "Edgar Allan Poe's Physical Cosmology". Quarterly Journal of the Royal Astronomical Society. 35: 177–192. Bibcode:1994QJRAS..35..177C. Canada, Mark, ed. (1997). "Edgar Allan Poe Chronology". Canada's America. Archived from the original on May 18, 2007. Retrieved June 3, 2007. CrimeLibrary.com (2008). "Death Suspicion Cholera". Archived from the original on June 5, 2008. Retrieved May 9, 2008. Carlson, Eric Walter (1996). A Companion to Poe Studies. Westport, CT: Greenwood Press. ISBN 978-0-313-26506-8. Cornelius, Kay (2002). "Biography of Edgar Allan Poe". In Harold Bloom. Bloom's BioCritiques: Edgar Allan Poe. Philadelphia, PA: Chelsea House Publishers. ISBN 978-0-7910-6173-2. Edgar Allan Poe Society (2007). "The Baltimore Poe House and Museum". Retrieved October 13, 2007. Fisher, Benjamin Franklin IV (1993). "Poe's 'Metzengerstein': Not a Hoax (1971)". On Poe: The Best from American Literature. Durham, NC: Duke University Press. pp. 142–149. ISBN 978-0-8223-1311-3. Foye, Raymond, ed. (1980). The Unknown Poe (Paperback ed.). San Francisco, CA: City Lights. ISBN 978-0-87286-110-7. Frank, Frederick S.; Magistrale, Anthony (1997). The Poe Encyclopedia. Westport, CT: Greenwood Press. ISBN 978-0-313-27768-9. Friedman, William F. (1993). "Edgar Allan Poe, Cryptographer (1936)". On Poe: The Best from American Literature. Durham, NC: Duke University Press. pp. 40–54. ISBN 978-0-8223-1311-3. Gargano, James W. (1967). "The Question of Poe's Narrators". In Regan, Robert. Poe: A Collection of Critical Essays. Englewood Cliffs, NJ: Prentice-Hall. p. 165. ISBN 978-0-13-684963-6. Glenn, Joshua (April 9, 2007). "The house of Poe – mystery solved!". The Boston Globe. Grayson, Eric (2005). "Weird Science, Weirder Unity: Phrenology and Physiognomy in Edgar Allan Poe". Mode 1: 56–77. Hall, Wiley (August 15, 2007). "Poe Fan Takes Credit for Grave Legend". USA Today. Associated Press. Harner, Gary Wayne (1990). "Edgar Allan Poe in France: Baudelaire's Labor of Love". In Fisher, Benjamin Franklin IV. Poe and His Times: The Artist and His Milieu. Baltimore: The Edgar Allan Poe Society. ISBN 978-0-9616449-2-5. Harrison, Edward (1987). Darkness at Night: A Riddle of the Universe. Cambridge, Massachusetts: Harvard University Press. ISBN 978-0-674-19270-6. Harrowitz, Nancy (1984), "The Body of the Detective Model: Charles S. Peirce and Edgar Allan Poe", in Umberto Eco; Thomas Sebeok, The Sign of Three: Dupin, Holmes, Peirce, Bloomington, IN: History Workshop, Indiana University Press, pp. 179–197, ISBN 978-0-253-35235-4 . Harrowitz discusses Poe's "tales of ratiocination" in the light of Charles Sanders Peirce's logic of making good guesses or abductive reasoning. Hayes, Kevin J. (2002). The Cambridge Companion to Edgar Allan Poe. Cambridge: Cambridge University Press. ISBN 978-0-521-79326-1. Hoffman, Daniel (1998) . Poe Poe Poe Poe Poe Poe Poe. Baton Rouge: Louisiana State University Press. ISBN 978-0-8071-2321-8. Hungerford, Edward (1930). "Poe and Phrenology". American Literature. 1 (3): 209–231. doi:10.2307/2920231. JSTOR 2920231. Huxley, Aldous (1967). "Vulgarity in Literature". In Regan, Robert. Poe: A Collection of Critical Essays. Englewood Cliffs, NJ: Prentice-Hall. p. 32. ISBN 978-0-13-684963-6. Jannaccone, Pasquale (translated by Peter Mitilineos) (1974). "The Aesthetics of Edgar Poe". Poe Studies. 7 (1): 1–13. doi:10.1111/j.1754-6095.1974.tb00224.x. Kagle, Steven E. (1990). "The Corpse Within Us". In Fisher, Benjamin Franklin IV. Poe and His Times: The Artist and His Milieu. Baltimore: The Edgar Allan Poe Society. ISBN 978-0-9616449-2-5. Kennedy, J. Gerald (1987). Poe, Death, and the Life of Writing. New Haven: Yale University Press. ISBN 978-0-300-03773-9. Koster, Donald N. (2002). "Influences of Transcendentalism on American Life and Literature". In Galens, David. Literary Movements for Students Vol. 1. Detroit: Thompson Gale. Lake, Matt (2006). Weird Maryland. New York: Sterling Publishing. ISBN 978-1-4027-3906-4. Ljunquist, Kent (2002). "The poet as critic". In Hayes, Kevin J. The Cambridge Companion to Edgar Allan Poe. Cambridge: Cambridge University Press. pp. 7–20. ISBN 978-0-521-79727-6. Maslin, Janet (June 6, 2006). "The Poe Shadow". New York Times. Retrieved October 13, 2007. Meyers, Jeffrey (1992). Edgar Allan Poe: His Life and Legacy (Paperback ed.). New York: Cooper Square Press. ISBN 978-0-8154-1038-6. Neimeyer, Mark (2002). "Poe and Popular Culture". In Hayes, Kevin J. The Cambridge Companion to Edgar Allan Poe. Cambridge: Cambridge University Press. pp. 205–224. ISBN 978-0-521-79727-6. Nelson, Randy F. (1981). The Almanac of American Letters. Los Altos, CA: William Kaufmann, Inc. ISBN 978-0-86576-008-0. New York Daily News (December 5, 2009). "Edgar Allan Poe's first book from 1827 sells for $662,500; record price for American literature". Retrieved December 24, 2009. New York Times (May 20, 1894). "Emerson's Estimate of Poe". The New York Times. Retrieved March 2, 2008. Ostram, John Ward (1987). "Poe's Literary Labors and Rewards". In Fisher, Benjamin Franklin IV. Myths and Reality: The Mysterious Mr. Poe. Baltimore: The Edgar Allan Poe Society. pp. 37–47. ISBN 978-0-9616449-1-8. Poe, Edgar Allan (November 1847). "Tale-Writing – Nathaniel Hawthorne". Godey's Ladies Book: 252–256. Retrieved March 24, 2007. PoeMuseum.org (2006). "Celebrate Edgar Allan Poe's 197th Birthday at the Poe museum". Archived from the original on January 5, 2009. The Raven Society (2014). "History". University of Virginia alumni. Retrieved May 18, 2014. Rombeck, Terry (January 22, 2005). "Poe's little-known science book reprinted". Lawrence Journal-World & News. Silverman, Kenneth (1991). Edgar A. Poe: Mournful and Never-Ending Remembrance (Paperback ed.). New York: Harper Perennial. ISBN 978-0-06-092331-0. Smoot, George; Davidson, Keay (1994). Wrinkles in Time (Reprint ed.). New York: Harper Perennial. ISBN 978-0-380-72044-6. Sova, Dawn B. (2001). Edgar Allan Poe A to Z: The Essential Reference to His Life and Work (Paperback ed.). New York: Checkmark Books. ISBN 978-0-8160-4161-9. Stableford, Brian (2003). "Science fiction before the genre". In James, Edward; Mendlesohn, Farah. The Cambridge Companion to Science Fiction. Cambridge: Cambridge University Press. pp. 15–31. ISBN 978-0-521-01657-5. Tresch, John (2002). "Extra! Extra! Poe invents science fiction". In Hayes, Kevin J. The Cambridge Companion to Edgar Allan Poe. Cambridge: Cambridge University Press. pp. 113–132. ISBN 978-0-521-79326-1. Van Hoy, David C. (February 18, 2007). "The Fall of the House of Edgar". The Boston Globe. Weekes, Karen (2002). "Poe's feminine ideal". In Hayes, Kevin J. The Cambridge Companion to Edgar Allan Poe. Cambridge: Cambridge University Press. pp. 148–162. ISBN 978-0-521-79326-1. Whalen, Terance (2001). "Poe and the American Publishing Industry". In Kennedy, J. Gerald. A Historical Guide to Edgar Allan Poe. New York: Oxford University Press. pp. 63–94. ISBN 978-0-19-512150-6. Wilbur, Richard (1967). "The House of Poe". In Regan, Robert. Poe: A Collection of Critical Essays. Englewood Cliffs, NJ: Prentice-Hall. p. 99. ISBN 978-0-13-684963-6. Bittner, William (1962). Poe: A Biography. Boston: Little, Brown and Company. ISBN 978-0-316-09686-7. George Washington Eveleth (1922). Thomas Ollive Mabbott, ed. The letters from George W. Eveleth to Edgar Allan Poe. Volume 26 of Bulletin of the New York Public Library (reprint ed.). The New York Public Library. Hutchisson, James M. (2005). Poe. Jackson: University Press of Mississippi. ISBN 978-1-57806-721-3. Robinson, Marilynne, "On Edgar Allan Poe", The New York Review of Books, vol. LXII, no. 2 (February 5, 2015), pp. 4, 6.